Most people know to call 911 right away in an emergency. But for employees of the United States Postal Service, the rules are different. An NBC Bay Area investigation has exposed a USPS policy that some say may have contributed to critical time delays in life and death situations. When Samuel Macasieb lay critically injured on the ground, time was the only thing that mattered. It was early in the morning on August 8 inside the west Oakland processing and distribution center, one of the largest and busiest postal service facilities in California, employing nearly 2,000 people. 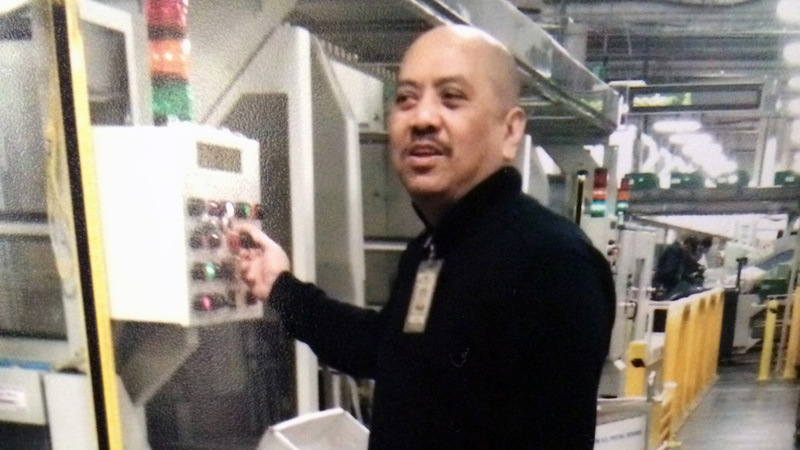 For 28 years Macasieb dutifully worked the graveyard shift operating a letter sorting machine. No one saw how Macasieb, 59, was injured but coworkers later said they found him lying on his back, barely conscious, with blood coming from his mouth and ears. Apparent head trauma left him incapacitated. According to an internal postal service report, employees didn’t call 911 right away. They proceeded to contact several supervisors and managers who then alerted the onsite postal police department, who finally contacted 911. Details in the report show that up to 53 minutes elapsed from the time Macasieb was found to when emergency medical personnel were contacted. According to the USPS, this chain of events wasn’t a mistake. It was a policy. Samuel Macasieb operating a letter sorting machine at the United States Postal Service processing and distribution center in Oakland. According to the internal report, when the first employee saw Macasieb he yelled to a nearby coworker, who contacted his supervisor. At the same time, another employee heard the call for help and ran to her supervisor. That supervisor told the employee to find the manager. The supervisor assessed Macasieb, waited for management to arrive and then contacted the postal police to summon first responders. The internal investigation report states that Macasieb’s coworkers found him sometime between 3 a.m. and 3:30 a.m. According to dispatch records, the call to 911 didn’t happen until 3:53 a.m.
More than a dozen employees from the Oakland facility told the Investigative Unit that postal service workers are routinely instructed not to call 911. They said managers hold periodic safety meetings to discuss important procedures and protocols with employees who work at the distribution plant. The Oakland policy mirrors the national USPS policy, which acts as a foundation for the thousands of district postal service policies across the country. The national policy instructs employees to contact the health services division and the onsite security office so they can call 911. Augustine Ruiz, a corporate communications manager for the USPS Bay-Valley District, which includes the Oakland facility, said the 911 policy exists to summon emergency responders as fast as possible. “It’s there to expedite matters,” Ruiz said. He said cellphone service is spotty inside of the five-story concrete building and that the postal police can initiate the 911 procedure from a reliable landline phone. Ruiz also said that postal police officers can grant paramedics access to secure areas of the facility. But in Macasieb’s case the policy seemed to slow down, rather than expedite the response. It was clear from the Oakland Fire Department Medical Services Division 911 dispatch tapes that the postal police officer had trouble relaying important information about Macasieb’s condition. The officer was on a completely different floor than where Macasieb was located, preventing her from being able to answer the dispatcher’s basic questions such as what part of the body was injured and whether his eyes were open. Fifteen separate times during the eight-minute call the officer had to use her radio to ask employees next to Macasieb to retrieve or pass along information. Several times the dispatcher asked if anyone on scene could call back with more precise information. “We’re talking about a human life and seconds matter,” said Dr. James Doty. As the chief of the Neuroscience Institute at El Camino Hospital in Mountain View, Doty has treated thousands of patients suffering from head trauma. He said when dealing with significant brain injuries, the sooner the patient receives medical attention the higher the likelihood that the person will have a better outcome. Ruiz acknowledged that connecting Macasieb with professional medical help “took a little bit longer than necessary.” But what Ruiz calls a little bit longer, Doty considers much more severe. “This is a matter of life and death,” Doty said. USPS employees with knowledge of the incident call the response far from excellent, saying the chain of events unfolded like a game of telephone. Many complained that the USPS’s 911 procedure prevented Macasieb from receiving emergency medical care as soon as possible. Employees said they want postal service leaders to create a new policy that encourages employees to call 911 first—then notify their supervisors and the postal police. After the Investigative Unit began asking questions about the delays caused by the policy, Ruiz said he would recommend changes to district leaders. “I can tell you I will be addressing it tomorrow,” Ruiz said on Oct. 30, when he spoke with NBC Bay Area. Any changes will happen too late for Macasieb. After the call to 911, paramedics responded in seven minutes and transported Macasieb to Highland Hospital in Oakland. But Macasieb didn’t wake up from his coma. No one can say if his outcome would have been different if 911 had been called sooner, but it’s a question that lingers with his wife. “Maybe if he was brought to the hospital [sooner] it could have been different,” she said. Larnie Macasieb and her three grown children decided to remove the family patriarch from life support 10 days later, one month before the surprise party they had planned for his 60th birthday. The cause of death, according to the Alameda County Coroner’s Office, was a blunt injury to the head.